Toasted curry and sweet coconut milk combine in this velvety smooth sauce. 1. Sauté sesame oil, curry powder, ginger and lemongrass paste in saucepan over medium heat for 1-2 minutes. garlic, peeled, roasted, minced	 2 tbsp. 2. 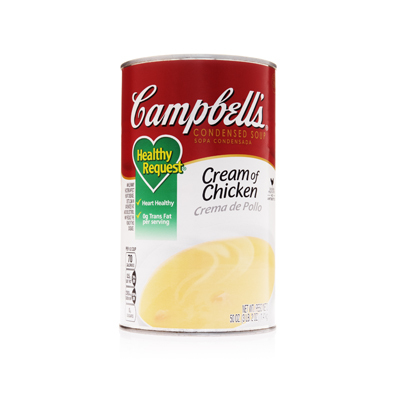 Add coconut milk, Campbell’s Healthy Request® Cream of ChickenCondensed Soup, water and roasted garlic. Bring to boil, then reduce heat to a simmer for 3-4 minutes. May substitute fresh lemongrass for lemongrass paste – simply dice and put in cheesecloth. Remove cheesecloth before serving. Add heat with jalapeño or chipotle peppers. Garnish with chopped cilantro before serving. Great with chicken breast and dark meat, pork chops and tenderloin, salmon, tilapia, red snapper, prawns, shrimp, asparagus, cauliflower, turkey breast.